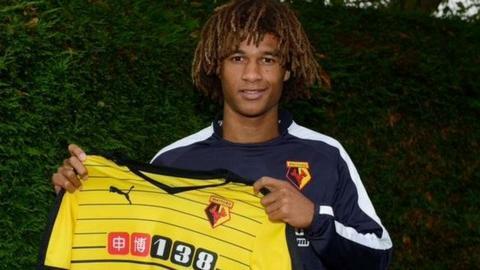 Dutch defender Nathan Ake has signed a new five-year deal with Chelsea and will be loaned to Watford for the rest of the season. The 20-year-old former Feyenoord player is set for his second loan spell having spent a month at Reading last season. Ake, who helped Chelsea win the FA Youth Cup in 2012, featured five times for the Blues last season. He is Watford's first loan signing of the summer, with Italy midfielder Alessandro Diamanti set to follow. Diamanti has been training with the club and Hornets manager Quique Sanchez Flores said: "Watford and [Chinese club] Guangzhou Evergrande are talking to arrange the last details and I expect him to come to us. "It will be difficult for Saturday but the deal is close."